Every woman loves a good manicure, but not every woman wants to pay upwards of $30 and take hours out of their day just to get those spa-quality nails. But we’ve all been there: we spend a great deal of care adorning our nails with a gorgeous color only to have it look like a hot mess or worse – chip off the very next day. That’s why we’ve compiled a list of the seven best nail polishes - so that you can get spa-quality nails in the comfort of your own home. And as always, we’re committed to giving you the best and most accurate advice. That’s why we look for honest reviews, overall brand reputation, and hard data about the product. And all of that gets factored into our ratings! If you’re searching for a tried-and-true nail polish, then look no further. This truly is the best nail polish in a class of its own. 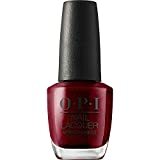 OPI is a trusted brand that nearly everyone who has ever painted their nails has heard of. They’ve dominated the industry for a long time and are renowned for a reason: their superior quality of products. For starters, they have over 200 shades of any color you could ever think of. That means it doesn’t matter if you’re going out for a hot date or looking to sport the latest floral trends, there’s a color for you! Their nail polishes last a week without chipping, which has been proven by the countless customer reviews agreeing with that statement. This means you can have a new color each week without ever having your nails look less than fabulous. Furthermore, the nail polish comes off with your standard acetone remover. That might not sound like an important point, but you’d be surprised how many polishes rack up complaints because of stubborn remnants refusing to leave their nails. The only potential negative we could find was the price. Reaching over the $ mark, this truly is a higher-end polish. But it is still cheaper than a single manicure, and you’re getting the high-quality you’d expect at a price point like that. For all the reasons we’ve listed above, and with really no glaring negatives, we’ve given this nail polish a perfect five-star rating. Another industry-giant, Essie has been a go-to nail polish brand since 1981. This is another high-end polish that boasts impressive quality and offers a respectable 100 shades. A bit expensive sitting at about $$, but that isn’t too ridiculous given the reputation of the company and the quality you’re getting. There are some differences, though, that separates this brand from other top-of-the-line brands – the most notable of such being the fact that it is Formaldehyde, Toluene, and DBP-free. That means you’re treating your nails a lot nicer by not using those harsh chemicals. Essie’s nail polishes also last a week being chip-free, which is a statement that reviewers seem to agree with unanimously. Essie also boasts a superior consistency of polish, making it easier to achieve that salon-quality look. Essie also advertises only needing one coat to achieve a pearly, colorful finish. This is important because, in the long run, it ends up saving you time and money. Plus your polish will last longer. The only negative we could find was through customer reviews. The common theme among complaints was that the color appeared slightly different on the nail than it did in the bottle or on the screen (if purchased online). Given the reasons we previously stated, it’s clear that Essie’s superior quality of product demands a spot as one of the best nail polishes. However, minor complaints cause us to give it a near-perfect score of 4.5 stars. ZOYA nail polishes lead a category largely untouched by the big players in the industry: vegan-friendly. This brand prides itself on delivering the same performance of high-end nail polishes while being free of the harsh chemicals that riddle the other players in the field. 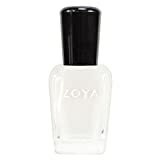 ZOYA is considered what is called “Big 10-free.” Meaning it doesn’t contain any of the ten leading chemicals commonly found in nail polishes – some of those being: formaldehyde, camphor, and lead. So this product provides an excellent alternative for people who are more conscious about what they are putting onto their nails. Aside from that, they offer 40 different colors, which is a bit low for the entire company, but there’s enough variety to satisfy most customers. The price is what you would expect from a nail polish that delivers quality and has a label such as vegan-friendly. It comes in over $$, which is at the higher end for most nail polishes. Overall, the quality of the product is desirable. Most of the time it turns out looking professional and smooth. There is, however, one common complaint found in customer reviews that seems to be plaguing this company: a few specific colors seem to be unforgivably thin, difficult to apply, and one color is even thought to turn out bumpy. No one wants a rough nail polish! Overall, this seems to be a great product, especially for the fact that it is vegan-friendly and free of harsh chemicals. And although there is only one main negative that is color-specific, it’s quite significant in our opinion, which is why ZOYA nail polishes are only getting a 4-star rating, when otherwise it would’ve been much higher on our list, maybe even labeled as the best nail polish. If you’re looking to save on time and money, then this is the best nail polish for you. This nail polish might be one of the lowest-price polishes you’ve ever laid your eyes on, but don’t let that fool you. You’re getting some serious quality for a little over $. Another remarkable thing about this nail polish is that it lives up to its name. It actually does dry in a minute! This is important to us because whenever a product makes a bold claim like that, it needs to be true. And according to the various reviews, it does. Speaking of reviews, the clear nail polish seems to be the clear winner in this category. It’s durable, gives a sparkling shine, and dries quickly, which is important because slower-drying polishes lead to higher risk of fingerprint marks tarnishing your new nails. The only major negative on this is that there is an extremely limited color choice. There are only seven colors available – eight if you count the clear. Plus, it’s very tough to find online, and that is including Amazon. You can, however, find it in most major department stores. For the low price, great quality, true claims, you can see why this landed a spot on our list. But because of the small choice of colors and the limited online availability, this gets a 4-star rating. Gel nails have been a hot trend in the past couple years, and it’s not hard to see why. A thick, glossy coat that lasts for weeks without chipping. Who wouldn’t want that? But what people don’t want is those harsh UV lights. Now, thanks to Revlon, you can have the best of both worlds: salon-quality look without the damage. Now to be clear, this isn’t actually a gel polish, it just looks like it. And according to customer reviews, it’s pretty hard to tell the difference. Though some reviewers have said that it can be a bit harsh on the nails if you have thin nails or sensitive skin. Another excellent thing about this product is the number of colors it comes in. It’s available in 40 different shades! That means there’s a color for everyone. It’s also relatively cheap compared to similar products, coming in at about $. Not to mention that each bottle comes with a wide applicator brush that helps prevent bubbling. However, it is important to note that a lot of customers are saying it takes a decent amount of time to dry between coats, and if you don’t wait until each coat is completely dry, it can still lead to bubbling, even with the special brush. Also worth noting that, because this isn’t a true gel polish, it doesn’t offer the same durability. Even though most people have said that it does last longer than regular polish before chipping. Because Revlon is a trusted brand, there are plenty of colors available for every occasion, and the appearance is directly comparable to that of a true gel polish, this earns a spot on our list of best nail polishes. However, since it is harsh on weaker nails and because it takes a decent amount of time to dry, this polish gets a four-star rating. This nail polish is incognito as a gel polish. You can get the same thick, shiny, fresh-manicured look right from home. This is a regular nail polish that is specially formulated to look voluminous just like a gel would. That also means that it lets you off the hook from having to use those harmful UV lights. Unlike other gel-esque polishes, this one doesn’t require copious amounts of drying time in between each coat. Instead, you only have to wait about five minutes before moving onto the next step. That’s a big plus because most other gel-mimicking polishes require you to pause for upwards of twenty minutes for it to look right. Another major point for Sally Hansen is that these polishes come in an astonishing 80 different colors! With a shade for each occasion, you won’t have to worry about switching brands just to get your perfect color. This nail polish costs about $ per color, which is sitting at the lower end of pricy. But that doesn’t include the Miracle Gel Top Coat Activator that you need to buy separately, which is an additional $. However, both the color and top coat should last you a long time, because you only need to use one coat of each. One thing worth noting is that some customers are saying that, even though it looks as beautiful as a gel polish, it doesn’t actually last any longer than a regular polish. So, because it offers a ton of different colors, looks like a gel when it is complete, and it saves you on time, we put this on our list. But because it is a bit expensive, you have to get two separate things, and it doesn’t last any longer than a regular polish, it earns a 3.5-star rating. Pure Ice nail polishes are a well-known, lower-end brand that is exclusively sold at Wal Mart. The best thing about this nail polish is that it is very affordable – only $ – and the quality is comparable to that of a more expensive polish. Pure Ice offers many different colors, including a top coat and a base coat. Another bonus is that this is also formaldehyde-free, so you don’t need to worry about putting harsh chemicals so close to your skin. While this polish offers a lot for such a low price, there are some negatives. Customers often found that the nail polish was thin, which means you need to use more coats. Another thing people mentioned was that the color wasn’t always faithful to the swatches. For the price, it is good quality, especially if you don’t mind putting in the extra time to add a few more coats. But the thinness does make it more difficult to apply correctly, and reviewers have mentioned the colors being slightly off, and that’s a big deal to us. For those reasons, Pure Ice nail polish gets a 3.5-star rating.